It is raining cats and dogs in my part of the world and all I want is a warm bowl of savory goodness that comforts my soul. I made a semolina-based savory dish for our breakfast today. Khara bath may not be rated as the healthiest breakfast recipe but it sure scores high on flavor. 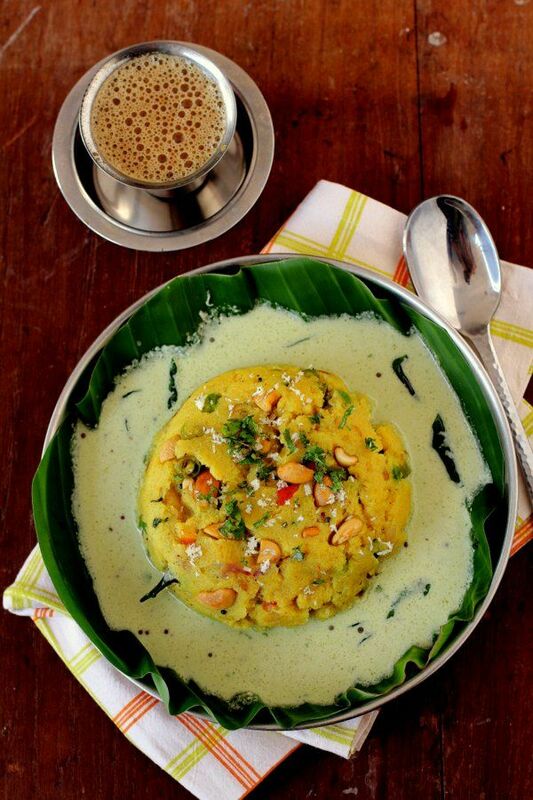 This Karnataka special sooji based breakfast is filling, comforting and hits the right spots. 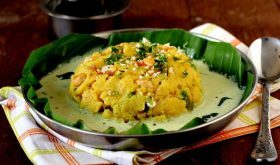 Khara bath recipe is very similar to our regular sooji upma but with a twist. The flavor is top notch. The secret lies in the ingredients which include a unique spice blend, khara bath powder, and oodles of ghee aka clarified butter. Khara bath goes by different names like rava bath, masala bath, sooji bath, semolina bath, tomato bhath and chow chow bath. They all mean the same dish, kharabath. 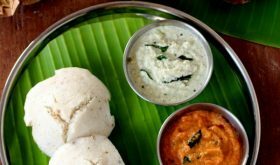 But, there are numerous variations to this tasty breakfast recipe, In fact, its a very popular restaurant item in Karnataka especially Bangalore and Mysore. 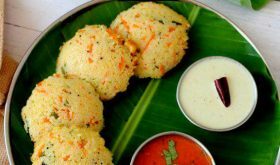 I have eaten it numerous times at different places like the Brahmin’s coffee bar, Darshini, and MTR (Mavalli Tiffin Room). It never tastes the same in any of the restaurants I have eaten. There is always a difference in the flavor of khara bhath at each of these places. Trying to recreate the same flavors at home is not an easy task. I am sure you will relish the khara bath recipe that I am sharing today since the flavors are spot on. If you are fan of South Indian tiffins, you should give rava bath recipe a try. Firstly, the semolina or sooji has to be roasted on a slow flame till it turns pink in color. It is an important step in the making of khara bath. You need to use at least three vegetables like onions, carrots, and tomatoes. You can add french beans, capsicum and green peas too. I have used onions, carrots, capsicum, green peas and a very small tomato for the recipe I am sharing today. Even if you do not have vegetables on hand, you can use onions and tomatoes. Khara bhath has a very soft, creamy texture which is soft like a pudding so the semolina to water ratio has to be taken care. For 1 cup of roasted rava you need to use 3 cups of water. Also, the addition of ghee helps achieve that incredibly tasty and smooth texture. If you reduce ghee quantity, you will not be able to savor the true flavor of khara bath. You can use both oil and ghee instead of only ghee. Other than the tempering of spices that go into the making of khara bath, a roasted and ground spice blend is used which gives it a unique flavor. I have made the spice blend from scratch while making khara bath. You can use homemade rasam powder (mtr brand also works well), vangi bath masala powder or bisi bele bath powder. If you do not have these spice blends on hand, you can add a small pinch of garam masala powder and 1/2 tsp of your regular kura podi you use in your regular cooking. But to savor the true flavor of kharabath, I’d suggest making the spice blend from scratch or use rasam podi or vangi bath podi. For today’s Khara bath recipe, I have used a very small tomato. Next week, I will share another popular variation that uses tomatoes and the khara bath has a lovely reddish color. 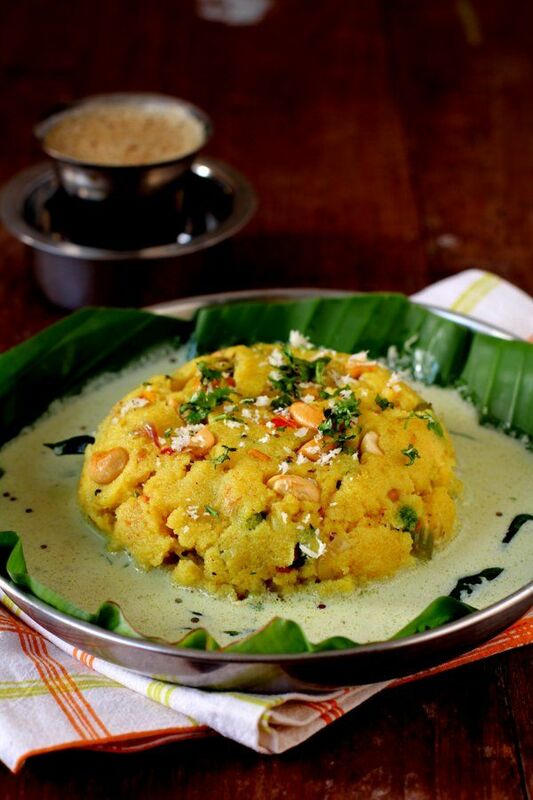 Khara bath is usually served with coconut chutney that is more on the liquidy side. Kharabath tastes best when hot off the stove. 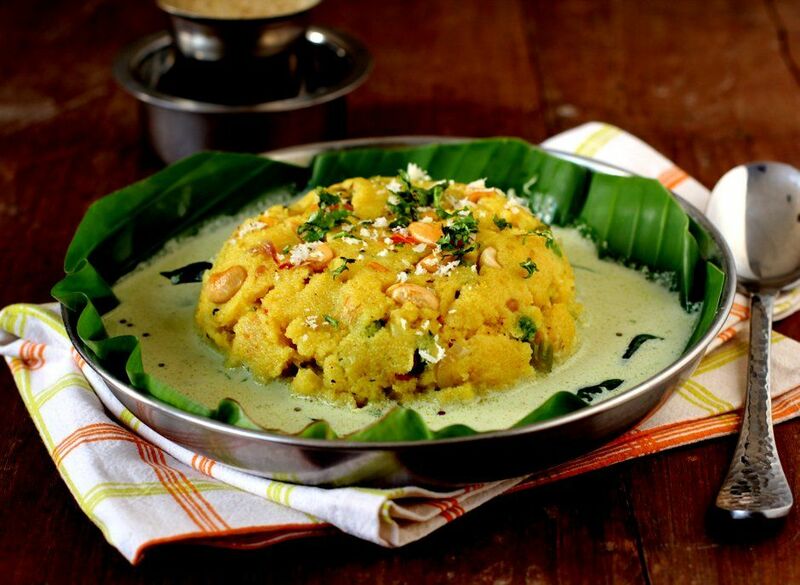 Even if you are not a upma fan, do give this khara bath recipe a try. 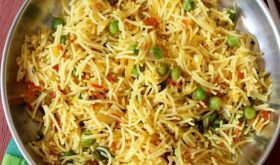 It has a flavor that is far superior to the humble upma. If you do, please share your feedback and pictures of kharabath in the blog comments or on social media. Would love to see them. You will find me on Pinterest, Facebook, Twitter, Google Plus and Instagram. Heat a heavy bottomed vessel and add the semolina and reduce flame. Roast the sooji over low flame for 5-6 mins. It should not be roasted over a medium or high flame. Constantly mix the semolina while roasting it. Remove to a plate and set aside. In the same vessel, add 2 tbsp ghee and 3 tbsp oil. Once hot, add mustard seeds and allow to splutter. Add urad dal and allow the dal to turn light red, Add the cashew nuts and allow to turn a light golden brown, Add asafoetida, curry leaves and green chilies and mix. Add the chopped onions and saute for 3 mins. Add grated ginger, carrots, and capsicum and saute for 5 mins over low flame. Add salt, turmeric powder, and the ground khara bath powder and mix. Add the chopped tomatoes, and chopped coriander leaves and cook for 2 mins. Add the green peas and mix. Add 4 1/2 cups of water, place lid and bring to a boil. Remove lid and continue to boil for 3 more mins. Reduce flame to low, using your left hand slowly add the roasted semolina into the simmering water while constantly mixing the contents of the vessel with your right hand. You will need to use some muscle power here to thoroughly mix it without any lumps. Place lid and cook for 5 mins on low flame. Add a tbsp of ghee and lemon juice and mix well again. Turn off flame and remove to a serving bowl. 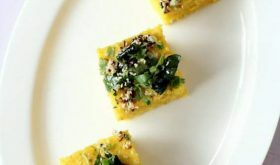 Garnish with fresh coriander leaves and freshly grated coconut. Serve with coconut chutney or peanut chutney. Khara bath tastes best when pure desi ghee is used generously. Coconut is optional. If you do not have it on hand, you can skip it. You can add 1/2 tsp of sesame seeds while roasting the spice blend. 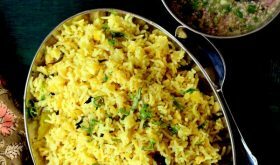 By Sailu Category: Indian Breakfast Recipes Published: July 20, 2018 Khara bath recipe, an authentic, tasty Karnataka style rava masala upma. Preparation with vegetables,semolina & ghee like mtr restaurant popular in Bangalore. Your recipes are easy to follow and always give mouth watering results. I can’t wait to try this one out. Thanks Sailu! You are most welcome, Meghana. Thanks for stopping by and sharing your encouraging feedback. Much appreciated. Another masterpiece….a mainstay during my college days in Bangalore in the 60’s. Lovely Sailu. Thank you so much for this recipe. I once thought, if you could send me fresh curry leaves to Germany. It is about ungettable here. These wil be payed beforehand incl. shipping.